Hi, Alan Gratz! Happy 2018! I am THRILLED to reveal Grenade’s cover. Thank you for allowing me to share it and for finishing my sentences. Grenade’s cover thrills me. I love the image of a boy, defenseless and alone, surrounded by soldiers, the world seemingly on fire. He’s trapped in the middle, just like the rest of the refugees during the horrific Battle of Okinawa during World War II. 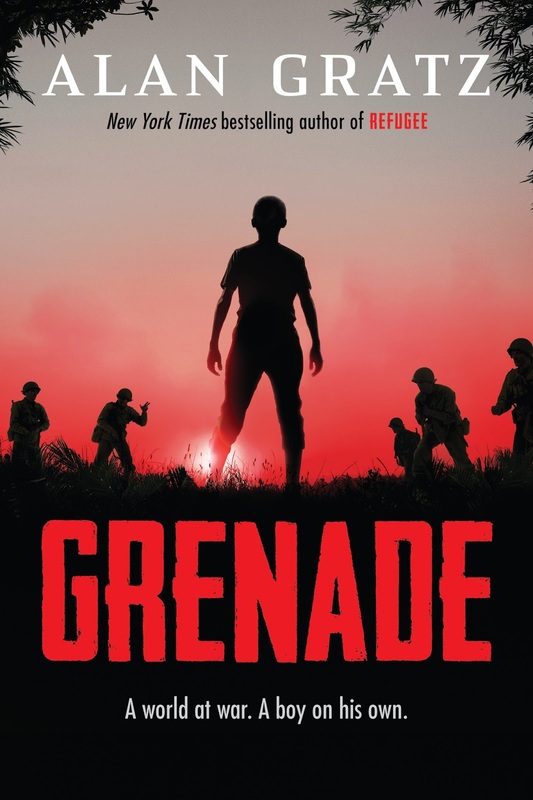 Grenade tells the story of a fourteen-year-old Okinawan boy named Hideki Kaneshiro struggling to survive the Battle of Okinawa in 1945. I visited Japan about ten years ago, and while I was there I met an old man who was a boy on Okinawa during World War II. He told me that the day the Americans landed, the Japanese Army pulled him and all the other middle school boys out of school, gave each of them a grenade, and told them to go off into the forest and not come back until each of them had killed an American soldier. That’s how Hideki’s story begins. What he does with that grenade is how it ends. Did you know that an estimated 150,000 of the 300,000 Okinawans living on the island before the war were killed, committed suicide, or went missing during the battle, including almost every Okinawan male over the age of 18? The US Army eventually took the island, but the ferocity of the Japanese soldiers, who fought to the very last man and committed suicide rather than be captured—77,000 of the 82,000 soldiers who died were Japanese—made the United States reluctant to invade the Japanese mainland, where they expected the death toll on both sides would be much greater. The awful carnage at Okinawa was a direct factor in the United States’ decision to drop atomic bombs on Hiroshima and Nagasaki two months later, which prompted Japan’s unconditional surrender. School libraries are the place to go for amazing stories! Wow, that's a lot of pizza, Alan! Grenade by Alan Gratz | Publication Date: October 9, 2018. It’s 1944, and the world is at war. Hideki Kaneshiro is a boy who lives peacefully with his family on the island of Okinawa, near Japan. Until the day World War II comes to Hideki. He is yanked out of school and drafted into the "Blood and Iron Imperial Corps" to fight for the Japanese army. He is handed two grenades and a set of instructions: go off into the jungle, and don’t come back until you’ve killed an American soldier. Meanwhile, young American soldier Ray Majors has just landed on the beach in Okinawa with his squad. He doesn’t know what to expect, or if he’ll make it out alive, but he knows he must keep moving forward. From opposite sides of the war, Hideki and Ray each fight their way through horrors and dangers, encountering new obstacles at every turn. But when the two of them encounter each other in the middle of the battle, the choices they each make in that single moment…. will change everything. This thrilling new novel from the New York Times bestselling author of Refugee is another searing, action-packed look at the ways in which war impacts young people—and the ways in which our courage and our conscience can redeem us even in the darkest of times.